Kokeb Gedamu is an ordained Rabbi of the IAMCS (International Alliance of Messianic Congregations And Synagogues). Congregation Burning Bush is also a member congregation of the IAMCS. He serves the IAMCS as their Regional Director for Africa. He also is the Director of the Board of Operation Tikvah (a humanitarian aid project) of the MJAA (Messianic Jewish Alliance of America). 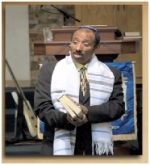 He also speaks in different congregations and churches in the United States to spread the message of what Yeshua is doing among the Ethiopian Jewish people in Ethiopia and Israel. He has a passion for revival, healing and deliverance, marriage, and teaching on the Jewish roots of faith in Yeshua / Jesus.